Clark Calvin Griffith (November 20, 1869 – October 27, 1955), nicknamed "The Old Fox", was an American Major League Baseball (MLB) pitcher, manager and team owner. He began his MLB playing career with the St. Louis Browns (1891), Boston Reds (1891), and Chicago Colts/Orphans (1893–1900). He then served as player-manager for the Chicago White Stockings (1901–1902) and New York Highlanders (1903–1907). He retired as a player after the 1907 season, remaining manager of the Highlanders in 1908. He managed the Cincinnati Reds (1909–1911) and Washington Senators (1912–1920), making some appearances as a player with both teams. He owned the Senators from 1920 until his death in 1955. Sometimes known for being a thrifty executive, Griffith is also remembered for attracting talented players from the National League to play for the Senators when the American League was in its infancy. Griffith was elected to the National Baseball Hall of Fame in 1946. Griffith was born in Clear Creek, Missouri, to Isaiah and Sarah Anne Griffith. His parents were of Welsh ancestry. They had lived in Illinois prior to Clark Griffith's birth. The family took a covered wagon west toward the Oklahoma Territory. Along the way, the family encountered hungry and disenchanted people returning from the Oklahoma Territory, so they decided to settle in Missouri. Griffith grew up with five siblings, four of them older. When Griffith was a small child, his father was killed in a hunting accident when fellow hunters mistook him for a deer. Sarah Griffith struggled to raise her children as a widow, but Clark Griffith later said that his neighbors in Missouri had been very helpful to his mother, planting crops for her and the children. Fearing a malaria epidemic that was sweeping through the area, the Griffith family moved to Bloomington, Illinois. A childhood incident taught him about the money side to baseball, Griffith recalled. When he was 13, he and a few other young boys had raised $1.25 to buy a baseball. They sent one of the boys 12 miles on horseback to make the purchase. The ball burst on the second time that it was struck. Griffith later found out that the boy who purchased the ball only spent a quarter, keeping the leftover dollar. At the age of seventeen, Griffith had made ten dollars pitching in a local baseball game in Hoopeston, Illinois. Griffith entered the American Association in 1891, pitching 226 1⁄3 innings and winning 14 games for the St. Louis Browns and Boston Reds. He began the following season with the Chicago Colts. In 1893, the pitchers box was moved back; it had been 55 feet from home plate and was moved to the modern distance of 60 feet, six inches. Following that change, offensive numbers increased across baseball and many pitchers had to adjust their approaches. Cap Anson was the player-manager of the Colts during Griffith's tenure and he utilized a rotation of only three starting pitchers. Just before Griffith's arrival on the team, pitcher Bill Hutchinson had thrown more than 600 innings in a single season for Anson, which may have contributed to a decline in Hutchinson's career. Griffith tried a new pitch to increase his longevity. By modifying the grip of a curveball, he threw a pitch similar to the screwball that Christy Mathewson had developed. He also often scuffed balls with his spikes or rubbed them in the grass. 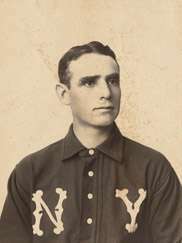 In 1894, Griffith began a string of six consecutive seasons with 20 or more victories, compiling a 21–14 record and 4.92 earned run average (ERA). 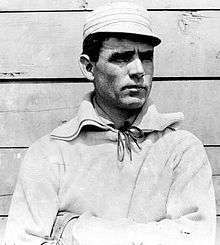 Griffith lowered his ERA over the following years to a low of 1.88 in 1898, the lowest mark in the league. When Ban Johnson, a longtime friend, announced plans to form the American League, Griffith was one of the ringleaders in getting National League players to jump ship. Using the cover of his post as vice president of the League Protective Players' Association (a nascent players' union), Griffith persuaded 39 players to sign on with the new league for the 1901 season. Griffith himself signed on with the Chicago White Stockings as player-manager. He won 20 games for the final time in his career and led the White Stockings to the first AL pennant with an 83–53 record. At Johnson's suggestion, Griffith left Chicago in 1903 to take over as manager of the New York Highlanders. The Highlanders had just moved from Baltimore, and Johnson knew that for the league to be successful, it needed a strong franchise in the nation's biggest city. Griffith retired as a player in 1907, though he made brief appearances as a player for the Reds (1909–1910) and Senators (1912, 1913 and 1914). After a falling-out with the Highlanders' ownership, Griffith was fired during the 1908 season. The team had started strong, but the team's pitching faltered as the season progressed and Griffith was criticized for trading away Jimmy Williams in exchange for a disappointing prospect. Griffith returned to the National League as manager of the Cincinnati Reds in 1909. In 1912, again at Johnson's suggestion, he returned to the American League as manager of the Washington Senators. When Griffith took over as manager of the Senators, he also bought a 10 percent interest in the team. At the time, the franchise had little going for it other than star pitcher Walter Johnson. In the American League's first 12 years, the Senators had never had a winning record or finished higher than sixth. To entertain the fans, Griffith hired Nick Altrock as a first base coach in his first season with Washington. Described as a "natural buffoon", Altrock engaged in lighthearted fun while coaching first base. He wrestled with himself, copied the motions of the pitcher and made the fans laugh with other antics. Griffith also engineered one of the biggest turnarounds in major league history, leading the Senators to second place. In nine years, his Washington teams only twice finished below fifth in the eight-team league. In 1919, Griffith joined forces with Philadelphia grain broker William Richardson to buy controlling interest in the Senators. Griffith boosted his share to 19%, while Richardson bought a 40% interest. Richardson and Griffith quickly came to an agreement that allowed Griffith to vote Richardson's shares as well. This all but assured his election as team president that November. At the same time, the Senators' home park, National Park, was renamed Griffith Stadium. Griffith stepped down as manager after the 1920 season to devote all his energy to the front office. He finished his managerial career with a 1491–1367 record. His 1491 wins ranked 19th all-time as of 2005. During his managing tenure, Griffith had a tradition of treating the fans to a farce game as the final game of the season. This tradition is a factor in the inflation of Walter Johnson's minuscule ERA (from 1.09 to 1.14) in 1913. Griffith was known for running the Senators on a shoestring. This was almost out of necessity; even with Richardson's assistance, he was forced to mortgage his Montana ranch to raise the money he needed to buy control of the team. Unlike most other owners, he had no income other than the Senators and Griffith Stadium. However, the Washington Redskins and other tenants enabled him to turn a profit for 21 years in a row. He was known for his faith in young players. He twice entrusted 27-year-old players to manage his teams—Bucky Harris in 1924 and Joe Cronin in 1933. Griffith's wagers appeared to pay off, as the Senators won the pennant in both years under their new youthful managers. In Harris' case, they won the 1924 World Series. Cronin came to the team as a player when Griffith's friend Joe Engel was placed in charge of the Chattanooga Lookouts at Engel Stadium. Engel was the first to scout Cronin for the club and said, "I knew I was watching a great player. I bought Cronin at a time he was hitting .221. When I told Clark Griffith what I had done, he screamed, "You paid $7,500 for that bum? Well, you didn't buy him for me. You bought him for yourself. He's not my ballplayer – he's yours. You keep him and don't either you or Cronin show up at the ballpark." Cronin later married Griffith's niece, Mildred June Robertson. In 1949, after a string of mostly humdrum seasons, Griffith almost lost control of the team when the Richardson estate sold its stake to John Jachym, who in turn sold his shares six months later to H. Gabriel Murphy when he could not obtain a voice in the team's affairs. Griffith was reelected team president, but it was understood that unless the team improved, the next vote would go against him. Griffith proceeded to buy stock from Murphy until he owned 52% of the club. In 1939, sportswriter Bob Considine expressed disappointment that Griffith had not already been elected to the Baseball Hall of Fame. He referred to Griffith as "the real father of the American League", citing the fact that Griffith had been a key force in attracting National League players to join the American League teams in their initial years. He wrote that Griffith "belongs in any hall of fame where the elective body is composed of sports writers, for no other reason than that no sports writer ever came away from the old guy without a story. Some of them were even kindly stories." Griffith had appeared on ballot for the second Baseball Hall of Fame election (1937), but he received 2% of the possible votes. In 1938, he received votes on only 3.8% of the submitted ballots. He received votes on 7.3% of ballots the next year. The Hall of Fame held only triennial elections for a few years. In 1942, 30.5% of voters submitted Griffith's name. Griffith was elected to the Baseball Hall of Fame by the Old Timers Committee in 1946. He was honored at the induction ceremony the following year. According to author Dennis Corcoran, Griffith had attended the initial Hall of Fame induction ceremony in 1939 but that there is no evidence that Griffith came to the 1947 induction or any other ceremony. In October 1955, Griffith was in the hospital with neuritis when he suffered a stomach hemorrhage. Though he appeared to be improving, Griffith died a few days after he was hospitalized. He was nearing his 86th birthday. After his death, newspaper accounts described Griffith's longtime relationships with U.S. presidents. During World War I, he successfully petitioned Woodrow Wilson to allow the continuation of baseball. He did the same with Franklin D. Roosevelt during World War II. He had also begun a tradition of presidents throwing out the ceremonial first pitch at a season's first Opening Day game, which started with William Howard Taft. When the Baseball Hall of Fame was being built and was looking for baseball memorabilia, Griffith donated several photographs of these presidential first pitches. League president Will Harridge called Griffith "one of the game's all-time great figures." Griffith was survived by his wife, who died of a heart attack two years later. He and his wife had no children, but they raised several relatives. A nephew who became his adopted son, Calvin Griffith, took over the team after his death and led efforts to have the club moved to Minnesota and become the Twins. Another nephew, Sherry Robertson, played infield and outfield for the Senators and the Philadelphia Athletics in the 1940s and 1950s. A monument was erected in honor of Griffith at Griffith Stadium. After the stadium was demolished in 1964, the obelisk was moved to Robert F. Kennedy Memorial Stadium, where the Washington Nationals played between 2005 and 2007. A collegiate baseball league, the National Capital City Junior League, was renamed in honor of Griffith after his death. The league suspended operations in 2010. ↑ "Clark C. Griffith of Senators Dies" (PDF, fee required). The New York Times. 1955-10-28. p. 25. Retrieved 2008-10-12. ↑ "Clark Griffith was raised near Sheldon". Nevada Daily Mail. October 11, 1911. Retrieved January 1, 2015. ↑ Bradham, Kelly (June 3, 1973). "Clark Griffith: Baseball great". Nevada Daily Mail. Retrieved January 1, 2015. ↑ Gilmore, Eddy (February 25, 1940). "Clark Griffith Continues Colorful Baseball Career". The Palm Beach Post. Retrieved September 18, 2013. ↑ Lenehan, Michael (August 1, 1981). "The Last of the Pure Baseball Men". The Atlantic. Retrieved September 18, 2013. 1 2 Leavengood, pp. 22-23. ↑ "Clark Griffith Never Had Chance to Resign, Was Summarily Dismissed from Highlanders". Duluth Daily Star. October 30, 1908. Retrieved September 18, 2013. ↑ Kelly, John (September 20, 2011). "Nick Altrock: A life rich in the stuff of D.C. baseball lore". Washington Post. Retrieved September 18, 2013. ↑ Armour, Mark (2010). Joe Cronin: A Life in Baseball. University of Nebraska Press. p. 69. ISBN 0803229968. ↑ "Clark Griffith". Baseball Reference. Sports Reference LLC. Retrieved August 2, 2016. ↑ Considine, Bob (November 23, 1939). "Griffith nominated for Hall of Fame". Deseret News. Retrieved January 1, 2015. ↑ "1937 Hall of Fame voting". Baseball-Reference.com. Retrieved January 1, 2015. ↑ "1938 Hall of Fame voting". Baseball-Reference.com. Retrieved January 1, 2015. ↑ "1939 Hall of Fame voting". Baseball-Reference.com. Retrieved January 1, 2015. ↑ "Hall of Fame ballot history". Baseball-Reference.com. Retrieved January 1, 2015. ↑ "1942 Hall of Fame voting". Baseball-Reference.com. Retrieved January 1, 2015. ↑ Corcoran, Dennis (2010). Induction Day at Cooperstown: A History of the Baseball Hall of Fame Ceremony. McFarland. p. 50. ISBN 0786491477. Retrieved January 1, 2015. ↑ "Baseball's Griffith on Critical List". The Miami News. October 23, 1955. Retrieved September 18, 2013. 1 2 "Baseball world mourns death of Clark Griffith". Times-News. October 28, 1955. Retrieved January 1, 2015. ↑ Corcoran (2010), page 13. ↑ Altschull, Herb (October 28, 1955). "Clark Griffith, Great Figure in Baseball History, Dies". The Portsmouth Times. Retrieved September 18, 2013. ↑ "Mrs. Clark Griffith dies of heart attack". The Tuscaloosa News. October 14, 1957. Retrieved January 1, 2015. ↑ "Clark Griffith, aged owner of Senators, dies". Gettysburg Times. October 20, 1936. Retrieved January 1, 2015. ↑ "Sherry Robertson Statistics and History". Baseball-Reference.com. Retrieved January 1, 2015. ↑ Wood, Phil. "A future moving experience". MASN. Retrieved September 18, 2013. ↑ "History of the Clark Griffith League". Clark C. Griffith Collegiate Baseball League. Retrieved September 18, 2013. ↑ "Clark Griffith Baseball". Clark C. Griffith Collegiate Baseball League. Retrieved September 18, 2013. Leavengood, Ted (2011). Clark Griffith: The Old Fox of Washington Baseball. McFarland. ISBN 0786486260. Wikimedia Commons has media related to Clark Griffith.